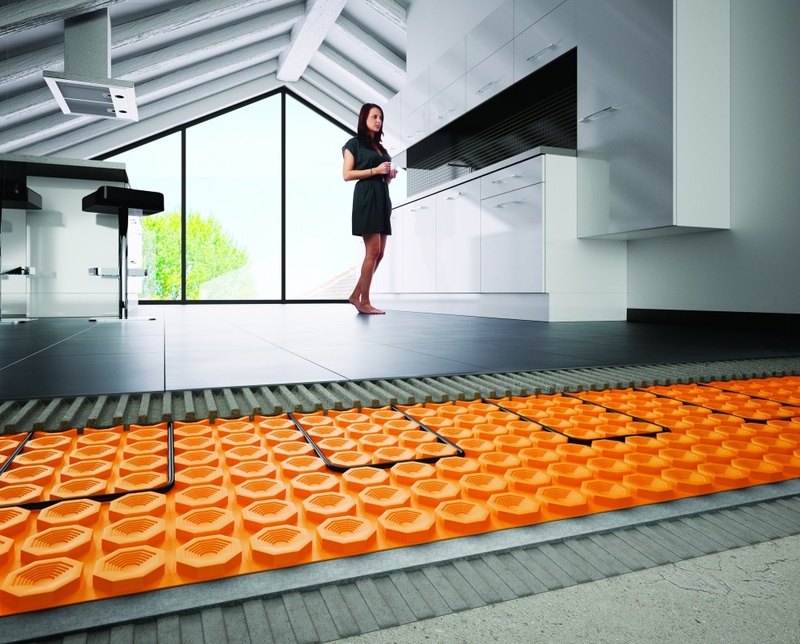 When the original DITRA-HEAT-E system was released in 2013, it was the first electric underfloor heating system of its kind. Taking its lead from the market leading uncoupling membrane, Schlüter®-DITRA 25, it combined protection and heating into one easy-to-use solution. The debut of DITRA-HEAT-E allowed specifiers to achieve considerable reductions in the height of heated floor assemblies, by negating the need for encapsulation layers and a separate uncoupling layer. 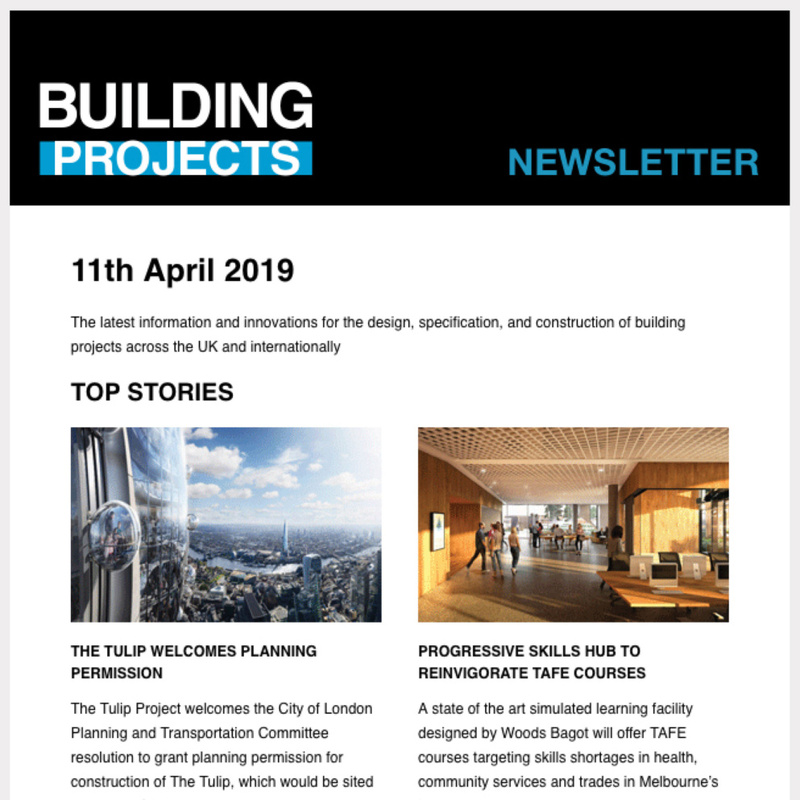 Fast-forward to today and with the latest iteration, you can also eliminate the requirement for a separate soundproofing layer, as well as achieving enhanced efficiency. 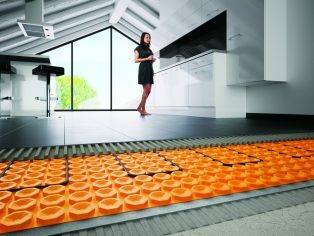 Schlüter®-DITRA-HEAT-E-DUO has set the new standard to surpass in electric underfloor heating. To all the great features of DITRA-HEAT-E are added two more: thermal breaking and impact sound reduction. These innovative features are achieved courtesy of a unique 2mm fleece laminated to the underside of the DITRA-HEAT-DUO matting. The thermal break allows the system to push 80 per cent of its input to the surface during the heat-up phase, whereas alternative systems can lose up to half of the heat into the screed or subfloor. The confirmed impact sound reduction of up to 13dB is perceived as a 50 per cent reduction by the human ear, resulting in increased privacy and peace. Like DITRA-HEAT-E, the DITRA-HEAT-E-DUO system provides bonded waterproofing, uncoupling, crack bridging and vapour pressure equalisation, to ensure that installations go the distance. As well as floors, it can be used in the creation of heated features, such as walls, shelves and seating, to further enhance the routines of building occupants. Each layer that can be eliminated from an assembly not only saves height, but also reduces the time and processes needed for installation. This means that Schlüter®-DITRA-HEAT-E-DUO offers benefits for parties across the construction chain. For more information call 01530 813396, email pr(Replace this parenthesis with the @ sign)schluter.co.uk or visit www.ditra-heat.co.uk.